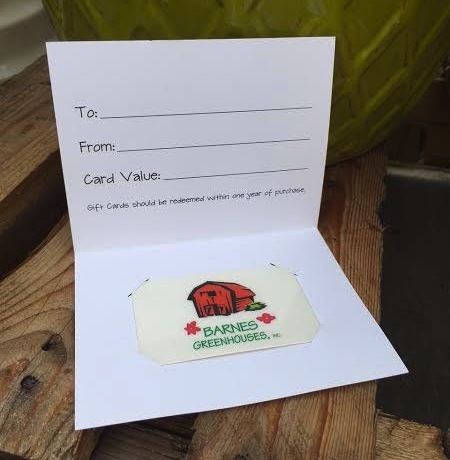 We have the perfect gift for the gardener in your life – a Barnes Greenhouses Gift Card! Gift cards can be purchased in any increments by phone or in person during regular business hours. For another easy shopping option – order online today! We’ll put the card in the mail within 24 hours of purchase or hold it in the garden center for the recipient. Barnes Greenhouses gift certificates are delivered in a paper card with a spot for a personal message and signature. We will be glad to mail gift cards within 24 hours of the order receipt to recipients. A minimal fee of $2.00 processing fee appearing as shipping will be charged to cover processing costs whether shipped or for pickup. Cards ordered and left in the Garden Center should be picked up within one week by the purchaser or the recipient. We request that Garden Center gift cards are redeemed within one year of purchase.